Sorry for my English but that forum is my last chance. So by accident(wtf?!) when I was installing Ubuntu(I had Windows7 before) I deleted all files and partitions 1. With system 2. With photos 3. With films and Ubutu made a one main partition which had 1TB of space(full HDD). 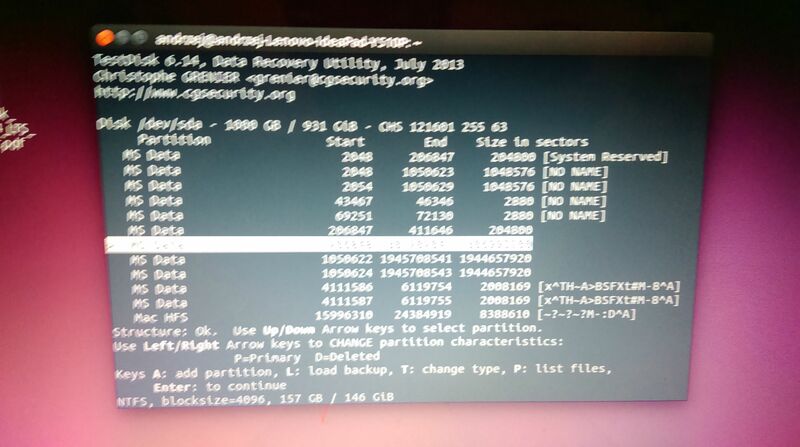 I ran testdisk but he found only 1 partition numer 3(with films, photo 3th, below) and he didnt find the others. I made deep search but it gave me nothing. He found MS DATA partitions which had exactly the same size that my old partitions were(photo numer 4) but testdisk said "Can't open filesystem. 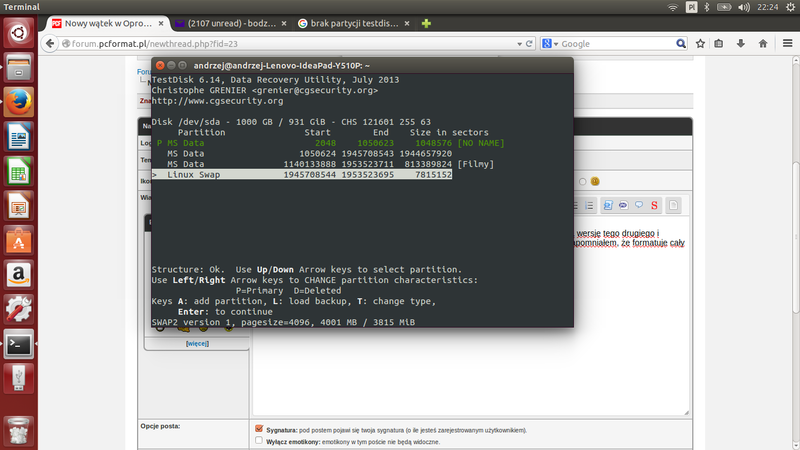 Filesystem seems damaged". I have copied files from No2 partition to my disc and I ran photorec to check if those lost files from partitions 1 and 2 are possible to recover. It made a 35 folders when I stopped process and I discovered that there were files from my old No1 partition so I again turned on testdisk and tried to recover(reboot??) boot sector. After that proccess I couldn't turn on partition numer 3(can't open....) and when I push P on the main partition I can see only Ubuntu directories. In the end of the story I discovered that I have 3000 folders made by photorec where I have all music, photos and files from partition 1 and 2 but they are "unnamed" and splitted up. ?! Before that I had 800GB free space on HDD. Now I have 100GB and in Windows a half of the HDD was empty. 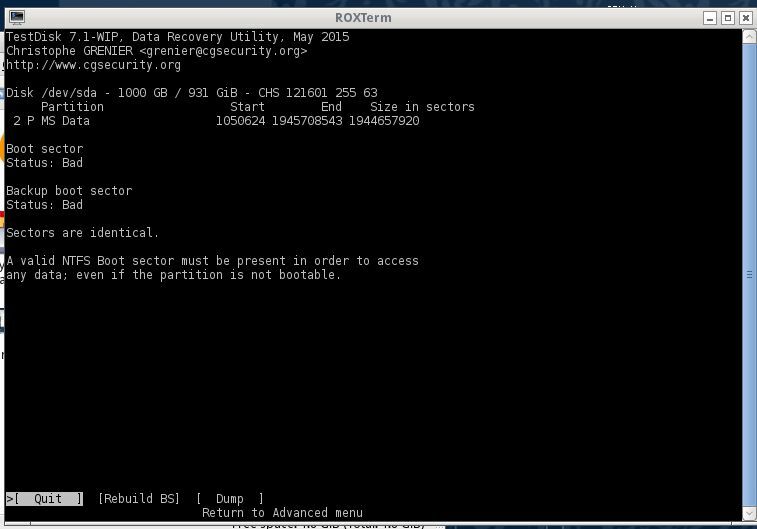 Will I get back my partitions in the original form? Im happy that I recoveried my photos but it's gonna be so irritating to regroup 80GB of them. Now I turned on PartedMagic. Partition Editor doesnt see old partitions but PhotoRec recovers the old photos so they have to be still there.